The bright lights of Singapore will shine down on one of the most competitive races of the F1 season on Sunday – and pole man Sebastian Vettel may find it hard to keep two charging Red Bulls behind him. Having trailed the Anglo-Austrian outfit for most of the weekend, the Ferrari ace pulled it out of the bag in the final qualifying session, whacking a wall on his way to a lap that left everything else he had done way behind. The driver on pole has won the last four races in Singapore and it was Vettel himself who led the field a merry dance in 2013 and 2015. But it seems likely that his scintillating final effort came thanks to a powerful engine mode that won’t be available to him in the race and the balance of times in all sessions suggests Red Bull have the edge at this twisting street circuit. The problem for Vettel is that the Red Bulls will surely have the upper hand in terms of tactics. They can ask Max Verstappen (second on the grid) or third-placed Daniel Ricciardo to make an early pitstop to force Vettel into a tough decision. He could decide to cover the early-pitting car to prevent his rival making up ground on fresh tyres, but that would allow the other Red Bull to use a longer first stint that might prove better over the race distance. His qualifying near-miss wasn’t the first mishap Vettel has had this week and another mistake under what is likely to be fierce pressure can’t be ruled out, making the German’s price look extremely short. 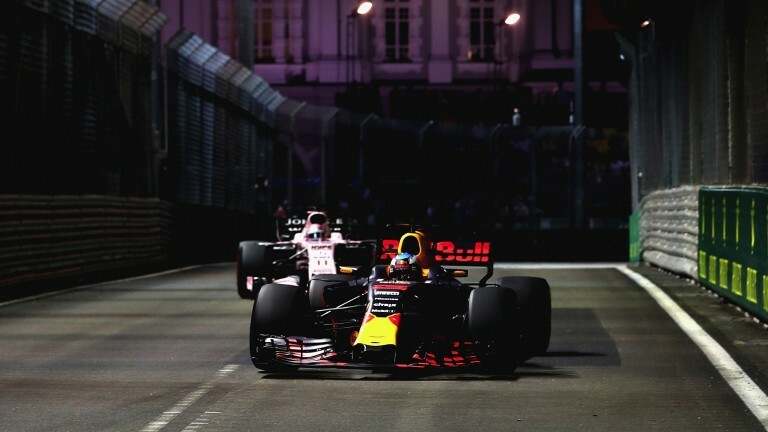 Ricciardo has finished on the podium in all three of his races at Singapore for Red Bull and the renowned street fighter looks the better value of the pair for those who aren’t keen on the safety of taking either Bull to win. Lewis Hamilton probably shouldn’t be quite as downcast as he sounded after qualifying, when he insisted that only a great start, clever strategy or safety-car interference could help him at a track where overtaking is tough. The Mercedes man is a solid fifth on the grid and his own street-course prowess is highlighted by the gap between him and his teammate Valtteri Bottas in sixth. He was well over half a second faster than the Finn in all three portions of qualifying and the 11-8 that he makes the podium and limits the world championship damage is not a terrible price. Both Red Bulls had technical trouble at times in practice, while Vettel and Verstappen, along with the second Ferrari of Kimi Raikkonen are all prone to taking liberties with the walls. Any mishaps to those drivers would help Hamilton and also create opportunities for midfield drivers to creep into the points and a first top-ten finish of the season for Jolyon Palmer could be on the cards. The British driver is losing his seat to Carlos Sainz next season but has been making steady progress and teammate Nico Hulkenberg is seventh on the grid. Palmer, a Monaco winner in GP2, starts 11th and has the car to get him on the scoreboard. Last year Nico Rosberg led throughout after starting from pole position, but Daniel Ricciardo closed the gap to under half a second by the finish. Sebastian Vettel finished fifth after starting from the back due to grid penalties.